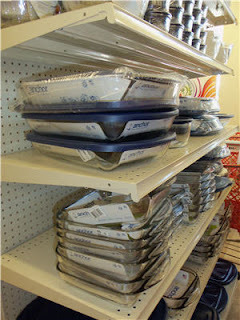 There were all sorts of glass bake ware and storage containers, many with snap on BPA free lids (yes, I checked it out for you.) I already have a square and a rectangle baking pan with snap on lids, and use them often. They help me avoid using disposable plastic wrap. This is a timely find because my aluminum baking pans rusted and I had to recycle them. 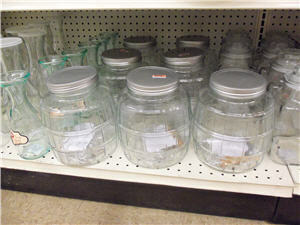 For those of you who don’t want storage containers with plastic lids at all, I found glass storage jars with metal lids. The large size makes them perfect for organizing and keeping bulk items fresh. 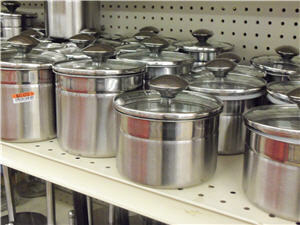 They had new canning jars (not pictured) and canning rings and lids. This is the reason I went to Big Lots in the first place. I bought both because after making blackberry freezer jam I have the itch to try canning something for real. Canning rings and lids, and look, more glass storage containers! 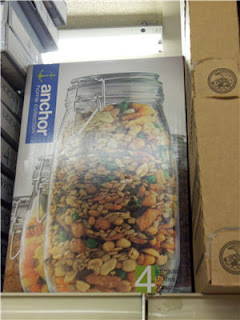 I saw many Anchor Hocking glass storage items. 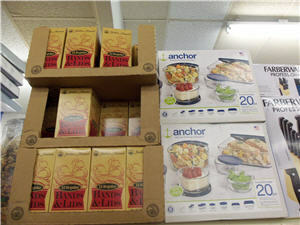 Anchor Hocking makes most of its products in Lancaster, Ohio. I’m buying local! That’s right folks buying local isn’t just for food. It can apply to anything you buy. I was tempted to buy these sweet Anchor Hocking glass storage jars even though I don't have room for them. As soon as I was hooked on Method’s soy candles, they discontinued the line because I'm lucky like that. I picked up a few of their candles because I like to burn a scented soy candle after dinner to clear cooking smells from the kitchen. I’ll give my mom the empty candle holder so she can make me one of her microwave soy candles. These stainless steel and glass storage containers could come in handy in the pantry, laundry room, or help organize a craft room. 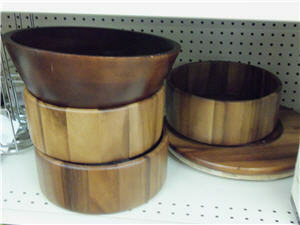 These wood serving bowls would look great serving food on your dining room table or for doling out Halloween candy. Just remember: hand wash only! I like the bowl with the straight sides. 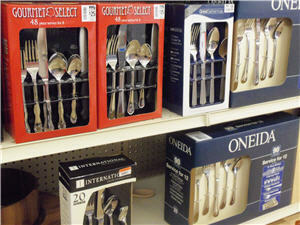 They had a slew of inexpensive silverware too. Husband and I gave his parents several boxes of silverware to keep on hand for big parties and get togethers on their farm because we were always buying disposable cutlery for those gatherings. This might not work for you if you do not have access to a dishwasher, don’t host a lot of events, or have the extra storage space (Sadly I’m all three.). 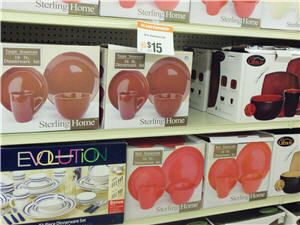 Hmm... those red dishes would look nice in my newly painted kitchen. I didn’t succumb to the extra temptation which is ever so easy to do at Odd Lots, at least for me anyway. I just bought the canning jars and rings I planned on buying. And some V8 juice. Whew - dodged that bullet! What about you? Have you found some good green shopping score lately? Update 10/15/10 3:55 PM: You guys are right. Odd Lots officially changed their name to Big Lots. I changed it in my post. I guess I was too dazzled by the bargains to pay much attention to the official name change. My bad. Disclaimer: None of the companies paid me to mention them in this post. Oh and Husband drank all of the V8 juice. I didn't get any of it. Looks like Odd lots is preety much the ame as Big Lots- and yes you can find eco friendly purchases there as well as most Dollar stores! Nice finds! oh, good, it is like big lots i see. what a great idea about the silverware, i honestly wouldn't have thought of that! i think i will have to look into fake pumpkins, but you brought up my point exactly. won't they just blow away? i wonder if you can stick something inside-they all seem to have that huge hole-that would have to have "grabbers" or something to hold it steady. hmm. something to look out for, i guess! Haha, wen you said Odd Lots, I thought you were just poking fun at the selection that Big Lots carries. I had no idea there was really a store called Odd Lots. Thanks for the post on your trip! 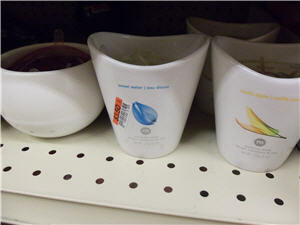 I never would have thought to look at Big Lots for glass storage. We are finally coming to the end of our plastic gladware containers, and need more glass replacements.